Eighteen months after NASA's spacecraft Dawn first entered the orbit of the dwarf planet Ceres, the wealth of information beamed back by the probe is revealing some surprising insights. Sitting between the orbits of Jupiter and Mars, Ceres, and its smaller cousin Vesta, are the largest surviving asteroids in the so-called main belt. 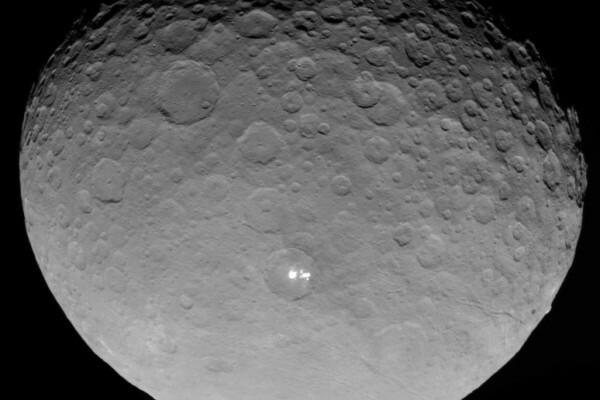 Dawn is the first spacecraft to ever visit the pair, arriving at Ceres in March 2015 following a 15-month stopover at Vesta. By studying the two asteroids, scientists hope to gain a clearer picture of the conditions that existed early on in the history of our solar system. As well as sending back colour photographs, Dawn is equipped with sensors that can identify minerals at the surface of Ceres. It can also map the asteroid's gravitational field, helping scientists to understand its internal structure. Six studies analysing Dawn's data were published today in the journal Science, making Ceres quite the celestial celebrity. "It's clearly a complex world," comments David Rothery, Professor of Planetary Geosciences at the Open University, "It's got a lot of geology that's gone on in the past". One of the most striking discoveries was that of an enormous volcano-like mountain, named Ahuna Mons. "It's a remarkable feature," says David, "The best explanation we have for it is that it is analogous to a lava dome on Earth...but this is not molten rock, it's caused by ice," he explains. Water ice is thought to be unstable on the surface of Ceres, making it difficult to detect. However, several of the studies point to its existence. Clay minerals, that need water in order to form, have been identified in the outer crust, and another study indicates recently exposed ice in one of Ceres' craters, Oxo. In fact, analysis of Ceres' many craters suggests that the asteroid's crust is neither pure rock, nor purely ice, but is made up of a mixture of the two. Meanwhile, Dawn has detected bursts of high-energy charged particles while in orbit, hinting at the temporary presence of a weak atmosphere surrounding the dwarf planet. Starting today, the probe will spiral upwards again to get a new perspective on the surface of the asteroid. Many mysteries remain, and this first flurry of reports opens up plenty more questions about the dwarf planet's complex geology. As the extended phase of Dawn's mission unfolds, it's clear that some of Ceres' secrets are still to be spilled. Previous Giraffe not single species, but four!